I love finding simple recipes that I can easily vary and keep the basic ingredients on hand for making a meal. Frittatas are very adaptable, you can put just about any combination of foods in them and it is a one pan meal. Most people think you need to use potato in them, which is the traditional way, but you can make them healthier by not including them. I have been searching for a recipe that has some basic quantities and calories I can follow. I think I have found a winner! All you need is egg, onion, mushrooms, spinach and feta. The mushrooms can be substituted with other vegetables like red peppers while the spinach can become basil or arugula in the summer and then the feta can be substituted with any variety of cheese from cheddar to mozzarella. If you keep to the same quantities the calories will be approximately the same which makes managing you calories for a meal a breeze. Pair the Frittata with a muffin and a cup of fruit and you have a delicious, colorful and satisfying meal with not much to clean up in the kitchen! 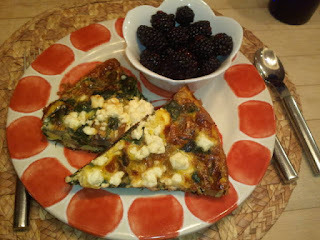 The Frittata recipe I found I like for its ease is -- Spinach, Mushroom and Feta Frittata that serves 4 with each serving having 235 calories.